Two concerts in the past week brought ten dance ensembles together. Chicago Human Rhythm Project’s “Windy City Rhythms” gave the city a head-start on National Tap Dance Day (May 25); and DanceWorks Chicago and Muntu Dance Theatre of Chicago shared a stage at the North Shore Center for the Performing Arts in Skokie. The scale of the two programs and their collaborative natures introduced some pacing issues and minor hiccups. But overall, these were strong examples of arts partnership and cultural exchange. “Windy City Rhythms,” which I attended May 11 at the DuSable Museum of African American History, gave an enthusiastic crowd including many kids a whirlwind tour of percussive dance and hip-hop, genially emceed by CHRP artistic director Lane Alexander. FootworKINGz, M.A.D.D. Rhythms and CHRP group BAM! all performed twice during two acts. Ayrie “Mr. Taps” King, Boom Crack! Dance Company, Martin “Tre” Dumas III and the Bronzeville Lighthouse Charter School Tap Ensemble presented one piece each. While the last and Boom Crack!, plus the “BBF Crew” from M.A.D.D. Rhythms West were all recitalish to some degree — one girl shuffled onstage late — I enjoyed seeing young dancers perform alongside seasoned professionals. No doubt the kids learned a thing or two from the experience to boot. FootworKINGz, featured in the otherwise horrid, seizure-triggering video for Nicki Minaj and Willow Smith’s “Fireball,” had the audience roaring after both of its brief numbers. The first, set to a juked-up mix of classic tracks including Cajmere’s “Coffee Pot (It’s Time for the Percolator),” was preferable to the second, whose soundtrack simply cut and pasted together familiar slices of mediocre pop from from the likes of Ke$ha and the Black Eyed Peas, and which suffered from a janky ending. 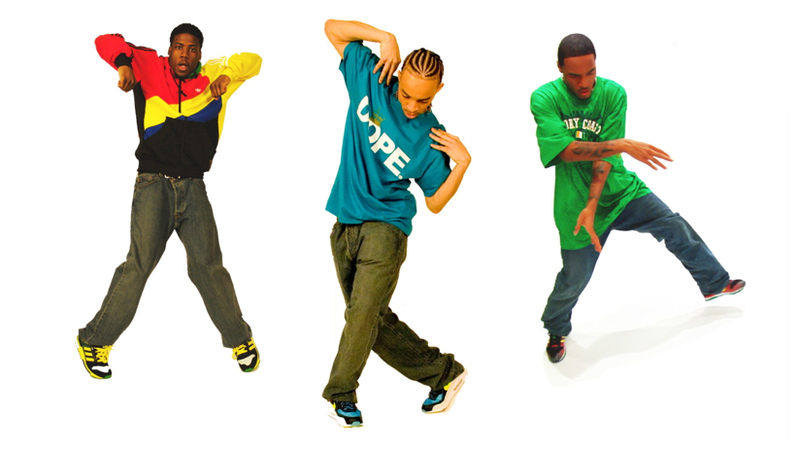 You can’t argue, however, with the speed and showmanship of these dancers: Stephan Gregory, Donnetta Jackson, Trevell Johnson, Kenneth Livingston, Brandon Love, and Eddie Martin, Jr. Great footworkin’ is pure energy and FootworKINGz are a power plant. Props to Alexander for programming a lineup that took us from the Percolator to his own Reflections, a premiere tap quartet set to three keyboard works by Bach, tenderly played by Joffrey Ballet accompanist Mungunchimeg Buriad. It’s a lovely work, which comes casually into being and then dissolves. I hope to see it again soon. Soloists Dumas and King couldn’t have less in common. The “Mr. Taps” routine is a wild, sequined ride, King’s seemingly stream-of-consciousness, tenor tap riffs alternating with runs of seemingly stream-of-consciousness half-jokes. Dumas’s taps have a bassy weight to them, real heft and seriousness, and long phrasing. Both are fine artists and their differences only contributed to a show whose chief reward was its variety. I saw six of the eight programs supported by the New Stages for Dance Initiative, which I detail here. My questions about the program when it was announced two years ago centered on whether it was a handout for venues in the guise of company support. When I asked Dance/USA executive director Amy Fitterer about New Stages last summer, she allowed that in a pilot year, “conversations like these are exactly the ones we need to be having. You’re absolutely right: There are going to be certain works of dance that might not fit in these particular [first-round] venues. There really is no one-size-fits-all.” There’s no word yet on whether New Stages will go another round in Chicago and, if so, what changes might be made to the initiative. If it does continue, I hope it fosters the kind of collaboration and exchange seen May 12 between DanceWorks and Muntu. They’re very different dance companies, both stylistically and in their objectives. Muntu is in its 40th year of presenting and maintaining dances from Africa and the African diaspora. (It’s also commissioned choreographers such as Reggie Wilson and Ronald K. Brown, who’ve built fine contemporary work on this foundation.) DanceWorks is a grad school, if you will, that stewards early-career artists. While their joint show began a simple tag-team affair, with the two companies alternating short works, it proved much deeper as it progressed. Three of 12 dances on the bill involved artists from both troupes, working together in three quite different ways. See(in) Me, by River North Dance Chicago alumna Monique Haley, featured a male-female couple from each group in choreography that employed multiple techniques. DanceWorks’ six members performed If Ever (an Ocean) Relinquished by Bay Area choreographer Alex Ketley, to live music by Muntu’s phenomenal percussionists. (The work has had multiple scores.) And a finale choreographed by Muntu artistic director Amaniyea Payne brought the artists together in celebration.